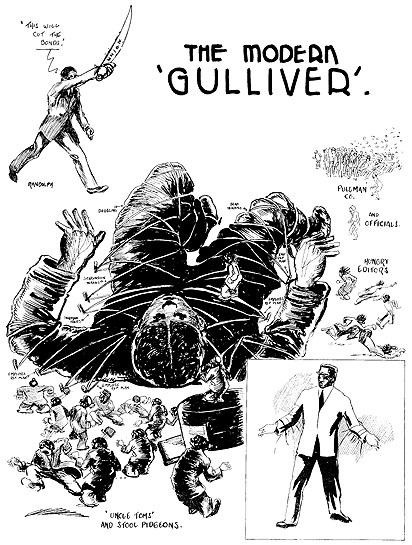 Cartoon appearing in the The Messenger, a Harlem magazine of Socialist politics and culture, edited by A. Philip Randolph who founded the Brotherhood of Sleeping Car Porters in 1925. In addition to his organizational activities in his union, Randolph was the major African-American trade union leader of the period. He fought to remove the "whites only" provisions from the constitutions of many of the American Federation of Labor unions of the period. He also played the leading role in organizing the proposed 1942 March on Washington, which did not take place and the historic 1963 March on Washington, which did take place and at which Martin Luther King, Jr. delivered his famous "I Have a Dream" speech. See also this poster about A. Phillip Randolph. Image from The Messenger, 1926, NYU Tamiment Library.